Harriet Beecher Stowe gave us the classic, Uncle Tom's Cabin, in 1852. Very little is known, however, of another book that was published the next year - 12 Years A Slave. This was a memoir, narrated by Solomon Northup, and was edited by David Wilson. The book came and went, but about a century later, two historians, on separate occasions, validated the facts of the story after their own individual research. And now, it is the talk of the western film fraternity, especially after the release of the movie, 12 Years A Slave, by Steve McQueen, that has been nominated for all possible awards at various committees. Solomon Northup (Chiwetel Ejiofor) is a free man in New York. He is a violinist, and has a wife and two children. His talent is much appreciated, so when two travelling performers offer him a job with them, he does not think twice, and travels to Washington with them. What he does not know is that he will not get a chance to see his family again for more than a decade. The two men drug him and sell him to a slave dealer. Solomon is taken to New Orleans, and he is bought at Theophilus Freeman's slave market by the plantation owner William Ford (Benedict Cumberbatch). Slave dealers tell him that his name is now Platt, a runaway slave from Georgia, and that he should stop insisting that he is a free man. Ford turns out to be a benevolent master, but he does not interfere much with his overseer's work. One of Ford's carpenters, John Tibeats (Paul Dano), constantly harasses Solomon, and matters come to a head when the slave retaliates with his fists. 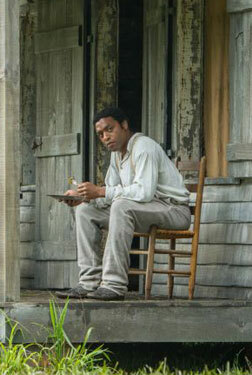 Ford decides that the plantation can become a dangerous place for Solomon, and sells him to Edwin Epps (Michael Fassbender), a cotton plantation owner. Epps has his own interpretation of slavery, and he quotes convenient passages from the Bible to prove to his slaves that they are inferior. He is sadistic and cruel, and rapes a young slave girl named Patsey (Lupito Nyong'o), regularly. In addition to her humiliation, her mistress, Mary Epps (Sarah Paulson), jealous of her husband's obsession, hits her and insults her whenever she can. Patsey begs Solomon to kill her, because she cannot kill herself, but he refuses. Although Solomon pretends to be illiterate and a nobody, he never loses hope that his status as a free man will soon be proved. He tries all that he can to get back to his family, and in the process, gets into trouble over and over again. What he does learn, however, is to survive. The movie does not water down the atrocity that the white slave owners felt their duty to impose on the lesser beings. Without sensationalising the impact, the script deals with community dwellings (for both genders), the distortion of the Bible, the superior airs of those not black, and the helplessness of the blacks, as well as the flawed laws that allowed for such an environment. The slave owners treated their slaves as property, with no regard for the human element. Since it is the story of Solomon Northup, he is the character that you follow and empathise or sympathise with; but actually, he seems to have had the easiest tenure as a slave. His fellow prisoners and labourers go through hell over and over again, especially the women. The screenplay does not shy away from showing the manipulative and often selfish nature of some of the oppressed people. Somewhere, the idea that the white race has a right to rule is accepted by all humans. The African Americans aspire to be like their white counterparts, given a chance, instead of creating their own identity. The movie is more of an attempt to make white Americans feel guilty about their history, than an attempt to elicit pity for the African bonded labourers. Much like the intentions of a movie on prosecuted Native Americans. In the book, Ford has a bigger role to play, but the screenplay conveniently ignores the acts of compassion from other whites, and concentrates instead on the victimisation of African Americans of that time. Fact remains that slavery existed, and the Southern plantations gave rise to a whole new culture. The ideology may not be relevant to present times, and the story will make you cringe with the outlandish principles that plantation owners believed in, but, again, this happened to one person. This is not as vast a representation of slaves in captivity as Uncle Tom's Cabin and Roots were - but it does give you a sense of history and what African Americans had to endure those days. Dialogues are simplistic, with enough accents and language modifications thrown in to show the difference between the privileged and the underprivileged, and the educated and the illiterate. Also, the characters are pretty much one-dimensional, without complicated layering. Every character is a victim of his or her circumstances, but the director lays the emphasis on the villainous nature of the whites and the innocence of the slaves. Chiwetel Ejiofor, often hailed as one of the most important actors of our time, delivers a flawless performance. He is there in almost every frame, but Michael Fassbender almost beats him hollow with his depiction of an arrogant brute. Various actors pop up in cameos - Paul Giamatti, Alfre Woodard, Garret Dillahunt and Brad Pitt (the shortest role of the lot) - but they make the impact they are supposed to. Benedict Cumberbatch deserved more screen time, both as an actor and a character. Sarah Paulson is a convincingly insecure wife with a streak of meanness. The most striking actor, however, is Lupito Nyong'o. Steve McQueen uses long takes without dialogues to make his point. This may get tedious sometime, like the one of Solomon trying to prevent himself from dying whilst hanging from a noose. The production design is simple, and cleverly done, evoking the period without too much fanfare. The costumes are almost monochromatic, much like the lives of both the slaves and their masters. Despite some radical shots, the cinematography does not jar the senses - if you have a weak stomach, however, be warned of some disturbing visuals that are unflinchingly realistic (such as the lash wounds on a slave's back). The sound design is hard-hitting, with long periods of silence and noises of the forest and insects. To add to that, Hans Zimmer composes a haunting soundtrack, including some non-intrusive but impactful music. The movie could have been shorter in length, though. 12 Years A Slave is not an easy movie to watch, but it is an important one. Important because we need to revisit history and understand human nature, or rather, the lack of humanity that existed in our hearts as recently as 150 years ago. Things may have changed drastically in the USA since then, and the people will always live with the guilt that led to making it the most powerful nation in the world, but at what price? The movie stays with you long after you have exited the theatre, and should definitely not be missed this weekend. Be the first to comment on 12 Years A Slave! Just use the simple form below. fullhyd.com has 700,000+ monthly visits. Tell Hyderabad what you feel about 12 Years A Slave!